You’re invited to a special evening exploring Flavor 101! Join us and sip extraordinary Alpha Omega Library and Single Vineyard wines while learning how contrasting flavors – Salt, Fat, Acid & Sweet – complement one another when used in the right measure. In the unique and breathtaking setting of the Barrel Cellar, lively entertainment will accompany a superb four-course meal prepared by Chef Bruce Riezenman. The evening’s menu will surprise and the wines will delight! A few of the featured wines for the evening include three Single Vineyard selections, Chardonnay Drew Vineyard 2015, Petit Verdot Dr. Crane Vineyard 2013, and Cabernet Sauvignon Thomas Vineyard 2016. We will also serve our Proprietary Red Wine 2010, a favorite vintage of this Bordeaux-style blend. 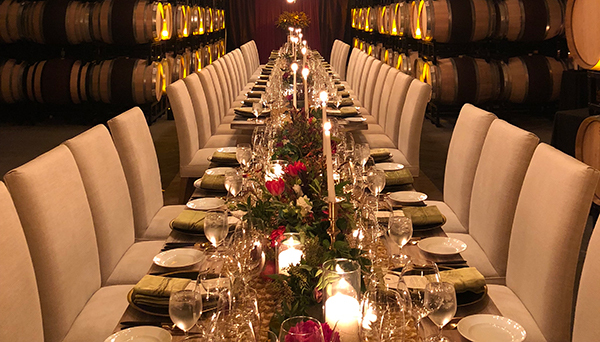 Please join Director of Wine Clubs Chris Carmichael for this rare opportunity to dine in a stunning setting, amidst the barrels of wine you will enjoy in the coming years.